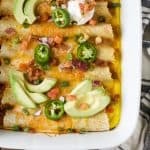 Easy Cheesy Overnight Breakfast Enchiladas filled with bacon, ham, veggies and an egg mixture. Make it the night before and bake in the morning! A delicious savory breakfast recipe perfect for brunch or the holidays! Heat a large skillet to medium high heat. Add diced bacon. Cook until browned, about 4-5 minutes. Remove from pan and let cool on a paper towel lined plate. Drain remaining bacon fat from pan. Next, add in diced ham. Cook until slightly browned, about 2 minutes. Remove from pan and place in a small bowl. To that same pan add diced red onion and red pepper. Saute until veggies are translucent, approximately 3-4 minutes. Next add garlic and saute for 30 seconds. Season with salt. Stir one last time and then add to bowl with cooked ham. To that same bowl, add the drained bacon. Gently stir to toss everything together. Spray the bottom of a 13×9 inch baking dish with non-stick cooking spray. To a tortilla add 2 tablespoons – 1/4 cup of the bacon veggie mixture. Roll up and place seam side down in prepared baking dish. Continue the process with the remaining tortillas. Set aside. To a small bowl add eggs and milk. Whisk until thoroughly scrambled and there are no more yolk separations. Pour egg mixture over the prepared tortillas. Cover with tin foil. Place in refrigerator overnight. Pour enchilada sauce over the tortillas and top with mexican cheese. Bake for 30-35 minutes. Until the eggs have set. Optional: garnish with green onions, sliced jalapeno, avocado, salsa or sour cream.